How to make an appointment on Hatfield? Please come in for a short screening session on a Monday, Wednesday or Friday morning (08:00-12:30) OR on Tuesday and Thursday afternoons (11:00-15:00). We see 10 new clients per day...be early! You will be seen for a short session to assess how we can help. You will then be booked with one of the psychologists if need be. You could alternatively be referred to a more appropriate service provider. 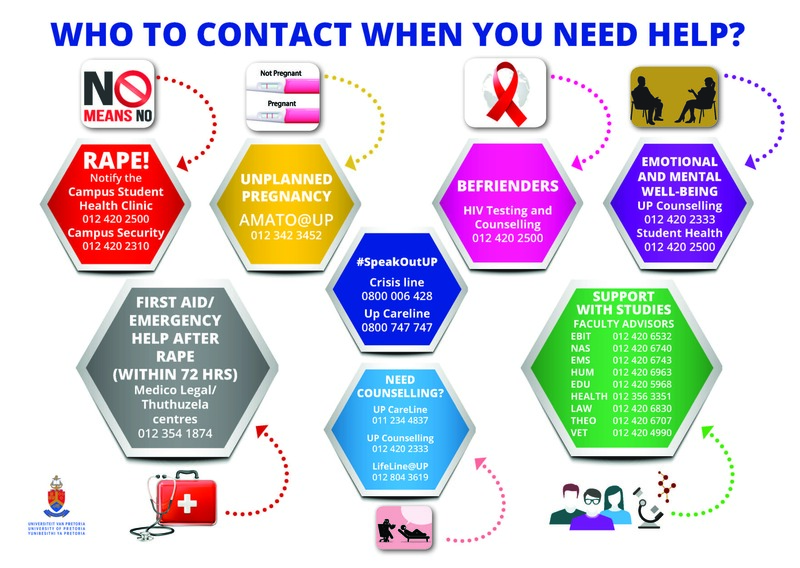 Contact Ms Ronél du Toit (Counselling Psychologist) to schedule and an appointment on Mondays or Wednesdays. Contact Ms Alexandra Norton (Counselling Psychologist) to schedule an appointment on Tuesdays or Thursdays. For direct contact details, please consult the information poster on the door of the Student Counselling Office, accross form Ed's Cafe in the Letlotlo Building. Contact her at [email protected] for an appointment and she will reply during office hours.